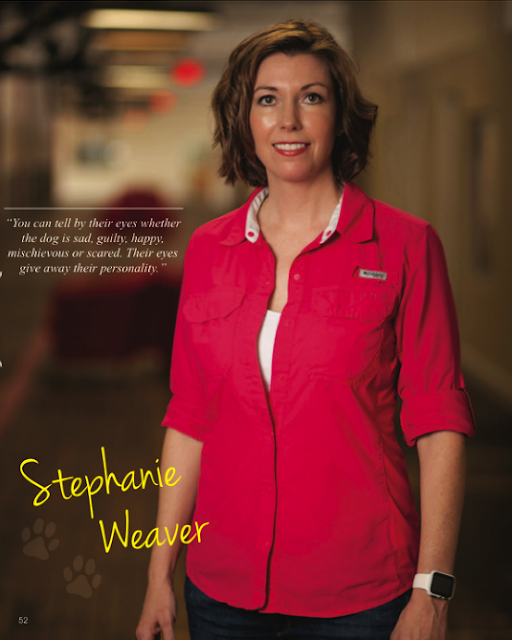 In October I participated in Barktoberfest in Franklin, Tennessee hosted by Nashville Paws Magazine. The annual festival is quickly growing to be one of the largest dog festivals in the Southeast. It was a SO MUCH FUN! There were around 12,000 people present for the agility competitions, costume competitions, great food and good family friendly fun! While I know I didn't get to visit with 12,000 people, I had a fantastic time visiting with everyone who visited my booth! 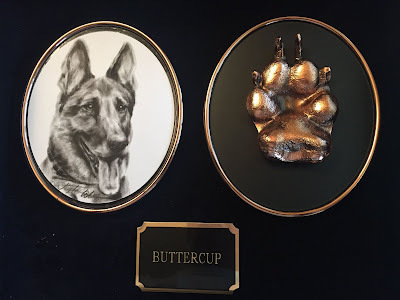 For those who dropped in my booth, I offered the opportunity to win a custom pet portrait in their choice of styles, Dry Brush Oil, Traditional Oil or Pop Art Acrylic (in an 11 x 14" or 12x12" gallery wrapped canvas, excluding shipping). And we have a winner! Meet Whisky yet (Whisky is the lucky dog who will be getting a pet portrait)! Whisky's family is looking forward to capturing this super dog and a fun portrait! I know there were many who were interested in getting a pet portrait completed by me and I will certainly be in touch shortly! I do apologize for not getting in touch sooner. The reason I haven't been in touch is because I've been hyper-focused on two things that I'll share with you...well one of them I can't share yet because it is a surprise for someone and I'll be presenting it to them in January in Gainsville, FL :). 1) Patty Paws by Patty-Cakes International Inc.
'Patty Paws' is another product offered by Patty-Cakes International. 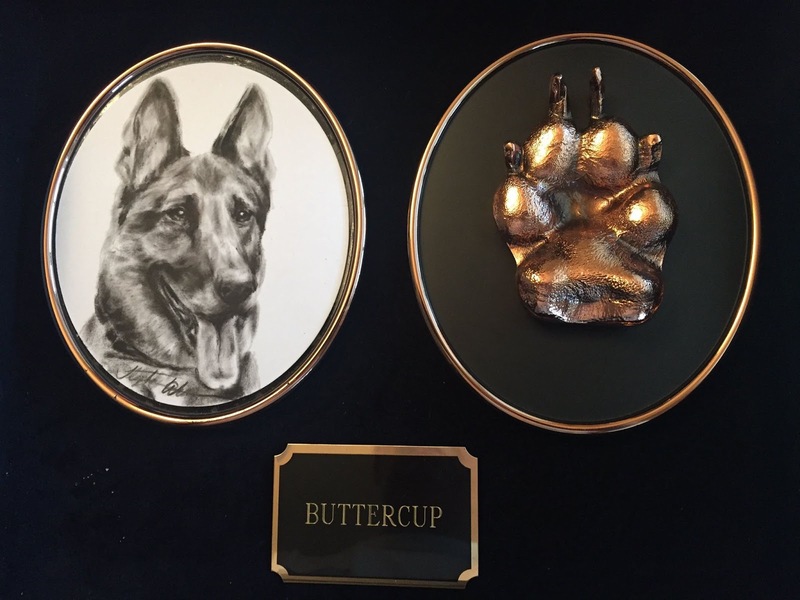 Patty-Cakes International is a 70-year-old company that provides custom, enduring and unbreakable bronze memories of a child's hands and feet...and now paws! Patty-Paws and I are teaming up to provide a timeless piece of art! 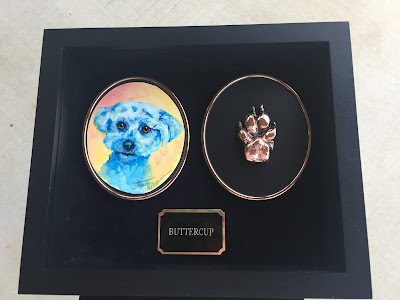 A custom pet portrait in either dry brush oil or pop art acrylic next to a bronzed paw print in a beautiful shadow box. If you'd like to receive more details about this, please contact Patty-Cakes International at info@patty-cakes.com. 2) I can't tell yet what else I've been hyper-focused on: but I swear, you'll want to be part of the HONOR! I'm working on something in honor of a hero who has served our Country for many years and his owner. So please, stay tuned. :) Here is a sneak peak though:) A time-lapse video of the dry brush oil painting. Feel free to contact me with questions/comments/suggestions!